As we move into our new home at Blocklotto.com, you’ll notice a gentle tweaking of some of the ways things work with regard to access and author privileges. Usernames – I’m asking everyone to use the format <firstname><dot><lastname> for their username. For example, my username is jeansophie.wood. It does not need to be your “display name”–you can define that in your progile–but I need it to tie you and your blocks to your name and address. Registering on the site – if you use the register function to request an account, you also need to send a message to me with your name and mailing address to join the Block Lotto. Your address is NOT kept on the site, but saved locally on my computer. If you register on the site and I already have your mailing info, you do not need to resend it. Be sure to sign up using the <firstname><dot><lastname> format. Becoming an author – to update your account with author privileges, you must first make your blocks. 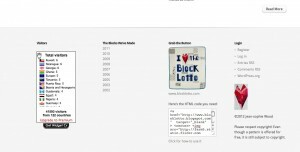 It may feel a bit like starting over for those that have made blocks in the past, but it’s the best way I could think of to validate which Block Lotto authors will continue in 2012. Click the link labelled register under the login heading to create your account. 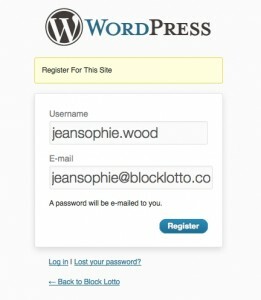 You’ll receive email with your computer-generated password and a link to login and set up your profile. I made my blocks……so can I post?